This is the best thing with a plug. Pop water and rice in the bowl, set the timer, and you’ll have a perfect bowl of rice waiting for you when you get home. Don’t worry if you get hung up in traffic, the Zojirushi will keep your rice perfectly moist, and warm. 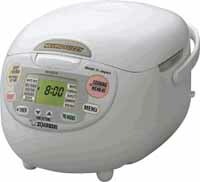 Commonly used in Japan, this type of fuzzy-logic rice cooker can be set ahead of time. I’ve purchased several for friends and family and have settled on the Zojirushi brand. I’ve used a Zojiriushi for several years, and it has held up well and completely changed my cooking habits. In the evenings I load up the pot with oatmeal and/or grain mixture for hot breakfast the following morning. And the mornings, I load up the pot for dinner – rice, whole grains, barley, lentils, beans, and/or spices. When I walk into the house after work, the air is fragrant with cooking. The cooker can keep its contents warm and fairly fresh for a few hours after the timer goes off. My favorite model is the Zojirushi NS-ZAC10 (5 cup capacity) though I’d get the larger model if I had a bigger family.